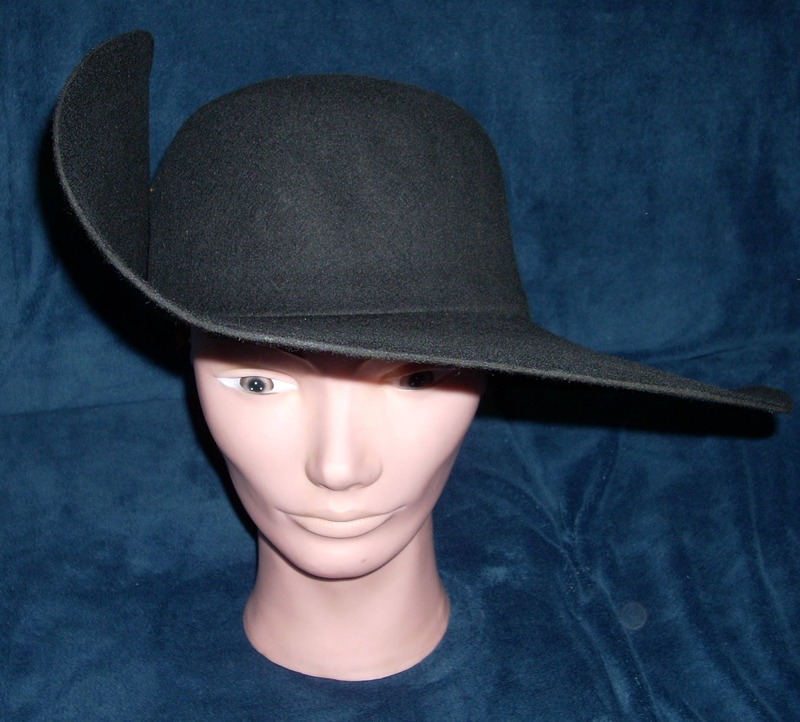 This cavalier hat is made from a Felt Hat Blank and is available in sizes M (7 1/8), L(7 3/8), and XL (7 5/8). To determine your correct size measure the circumference around where you would wear the hat. Basically, from level with the forehead around. M size is about 22 1/4 inches, L is 23 inches, and XL is 23 7/8 inch. 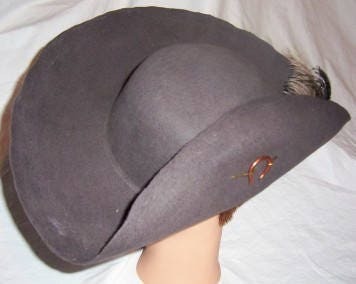 The hats pictured are Black, Dark Brown, Gray, Red, Tan and two other angles of a black hat. 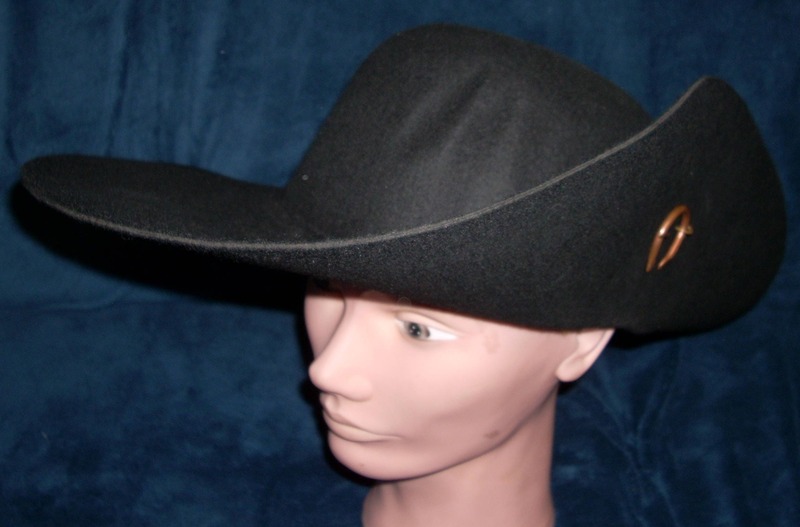 The hat brim measures between 4 1/2 and 5 inches depending on where on the hat you measure it. The crown is 4 inches high. Due to variations in the hat making process these measurements are a close approximation to the hats and are a guideline for sizing. Since these are felt they will stretch a bit when worn so if are an in between sizes I would recommend going with the smaller size closest to your measurement. Also if you plan on wearing a wig or cloth under the hat please allow for the extra thickness of these items when picking your size. I do try to keep all sizes and colors available but if I'm out it can take up to 2 weeks before a hat can be mailed. I secure the hat with a penannular cloak clasp that was hand crafted by my friend Thomas and will also vary slightly from piece to piece. The hat comes with your choice of one large ostrich feather or 2 smaller or other type of feather. If you want a particular color or type of feather please include a note at time of purchase to let me know your choice otherwise I will just choose 2 smaller ones for you. You may also choose between a Nickel or Brass Pin. 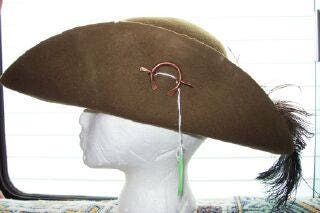 The hats are pictured with the Brass and the nickel is a silver tone color. The Ostrich feathers can come in white, black, purple, yellow, wine, green, orange, blue, and red. Check to see for availability on feather colors as I may not always have all colors in stock. You may also choose between pheasant and striped turkey quill feathers as well as the 12" Peacock Eye feathers if you are taking the two feather option. 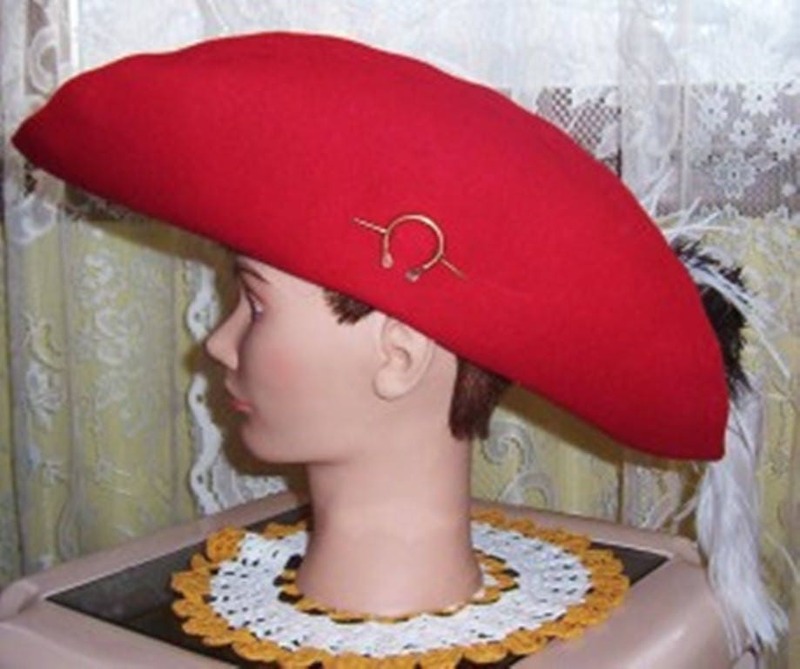 The felt can be a bit stiff when you first get it but it will soften up with repeated wearings and mold itself to fit the unique shape of your head. I have them in either Tan, Dark Brown, Black, Gray and Red. Also the tan may be darker than it appears in the picture on your computer screen. The hat comes with pin inserted and folded up on the side but untrimmed. 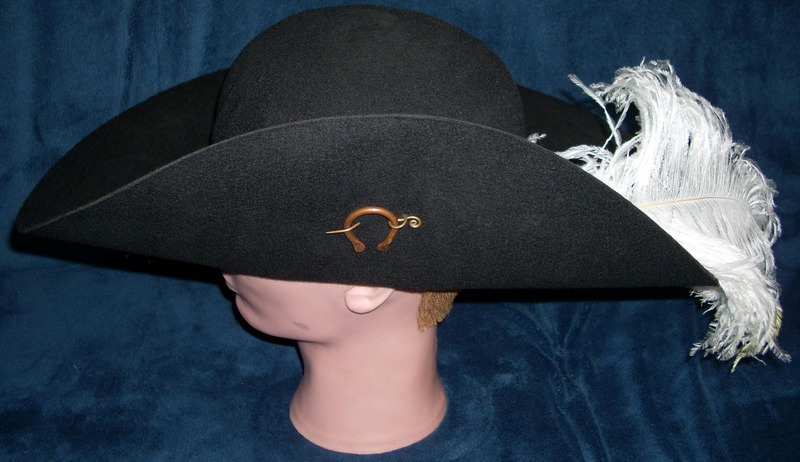 The hats can be trimmed and cut as you desire but is not necessary. They have a slight scalloped look to the edges when untrimmed that a lot of people like to leave as is. The feathers come loose in the box to keep them from getting broken during shipping. You simply insert the feathers behind the pin in the fold of the hat. I would suggest tacking them down with needle and thread for added security in case of a windy day. 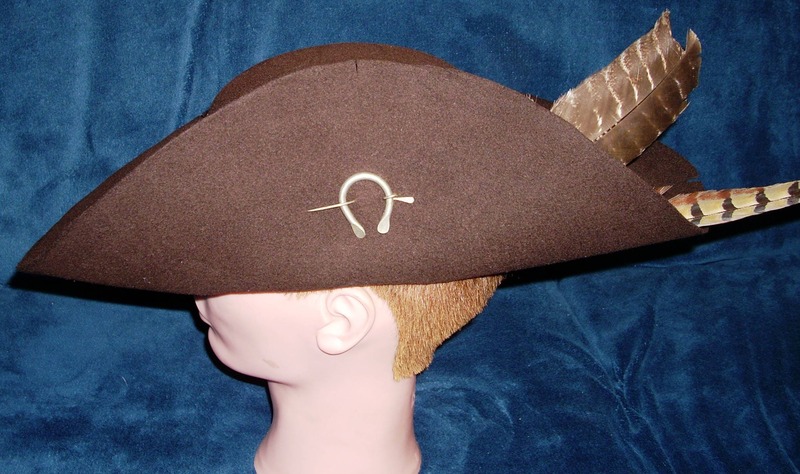 These hats are great for Renaissance Fairs and other re-enactment events. They also make a great pirate or pioneer era hat. The hat may be slightly bent from shipping but is easy to bend back into shape once taken out of the box.